Building and maintaining a successful team is no simple task. Even people who have taken their teams to the highest level in their field have difficulty recreating what accounted for their successes. Is it a strong work ethic? Is it chemistry ? What tools can you wrap your hands around to build or rebuild your team? In "The 17 Indisputable Laws of Teamwork," leadership expert and "New York Times" bestselling author John C. Maxwell shares the vital principles of team building that are necessary for success in your business, family, church, or organization. The Law of High Morale inspired a 50-year-old man who couldn t even swim to train for the toughest triathlon in the world. "The 17 Indisputable Laws of Teamwork" will empower you whether coach or player, teacher or student, CEO or non-profit vollunteer with the how-tos and attitudes for building a successful team. 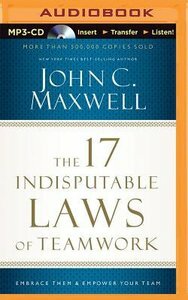 About "The 17 Indisputable Laws of Teamwork (Unabridged, Mp3)"
Customer Reviews For "The 17 Indisputable Laws of Teamwork (Unabridged, Mp3)"
Having just taken on a new role, I'm listening to a few of John C Maxwell CD's. This was great for help on Teamwork and I found that I can put into use a few of the Laws he speaks on. Such wisdom and guidance available.